If you haven't seen these before, they're called spring strips and they're perfect for glasses cases, little bags etc. 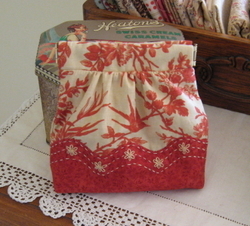 I saw (and bought) them at the Australian Quilt Convention in February. I stood there for ages deciding firstly, would I use them (or was I just going to store them forever in the box labelled "thought these were a good idea at the time"); secondly, what would I make; thirdly, what size (because as soon as you arrive home you'll think I should have bought the other size); and fourthly, how many to buy (since you'll never buy the right number). I'm sure many of you have been faced with a similar dilemma. In fact I went back to the stand and made a second purchase just before we left. Now I'm very pleased to say I have used them. Well not all of them, but the fact I've come home and done something with them is a fabulous feeling. They are my favourite new 'gadget'. 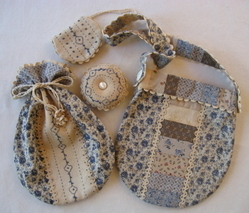 This little bag was a gift, so I'm hoping to find time this weekend to make one for myself. Sometime after the housework, gardening, family commitments..... so if I'm realistic, probably not. And spring strips are perfect for a Rotary Cutter case. And just in case your wondering, yes these are a couple of the gifts I had to have finished by today. I love making gifts for family and friends. I feel a little guilty if I find myself in a store making a purchase. It would be wonderful if I could spend days working on an item, but the reality is I have limited time to spare. So the gifts are usually small, simple and quick to make. Now by quick I mean any project that can be made in under four hours. I like to think of them as morning or afternoon projects. This is one of my favourite quick projects. A stitched heart filled with lavender. It can be slipped inside a greeting card and posted to a friend. Just a nice way to say 'Hope you're feeling better soon' or 'Thank You'. Now there is another reason why I need to have some simple and quick items to make. I need three birthday presents by next Friday. One is finished, another started and the third, well I can't make up my mind what to make. I couldn't decide what colours to use for the stitchery until I found this piece of fabric. It's Civil War Dressing Gowns by Judie Rothremel. I purchased it a few months ago and still like to unfold it, play with it, dream, and then refold it. Here's hoping the recipient will love it as much as I do. I have a confession to make. I've been sneaking fabric into the house without telling you about it. Here are my latest purchases (I think). Please don't ask what I will be making with them. I just bought them because I had to. Absolutely love the butterfly print. Obviously it will need to be used in something pretty special. I think I'll use it with the dark brown on the right and maybe the blue in the corner. Yes, it is all very vague. These are my favourite scissors. If you haven't seen them before they re called Arm Wrestlers and they're the only scissors I use. 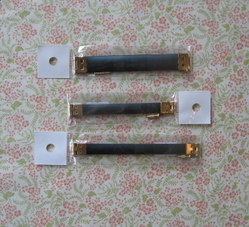 They have a full sized grip and are very light. I think they're so wonderful I had to buy myself another pair just in case.... I'd be lost without them. If you look closely you'll notice the label has rubbed off the handle. I've had them for over 4 years and they still cut as beautifully as the day I got them. Now, another confession: I've cut template plastic with them. Yes, I can hear you all gasping in horror. 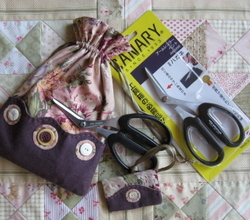 And the winner of the Molly's Doll Quilt pattern is Sue. Congratulations Sue, if you could email with your postal address I'll pop it in the mail for you. Thank you to everyone who entered and for all your lovely inspiring comments. Here is a sneak peek of the new project I'm working on. As usual I'm not quite sure where I am going with it. Just adding bits here and there. I bought the paisley fabric (FOLKLORIQUE by Joanna Figueroa and Lisa Quan FigTree Quilts) last year and teamed it with the stripe from the Bossom range by Urban Chiks. I'm hoping I'll find time to keep working on it tomorrow and just maybe finish it. 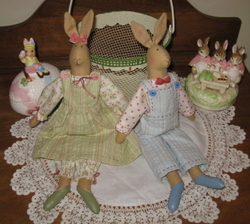 I did a little rearranging in a cupboard yesterday and came across Peter Rabbit and the Easter bunny. So I couldn't resist pairing them with Oscar & Pip. Now I know there is something missing from this picture. Shouldn't the bucket be brimming with Easter eggs? 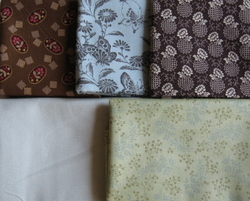 You know I can't resist buying fabric, well I can't resist chocolate either. O.K. so now your probably picturing me scoffing down a whole bucket of Easter eggs. Well sorry to disappoint all my fellow chocoholics out there, but no I didn't. After many many years I have finally discovered the secret to resisting chocolate and it's simple. I don't buy it! 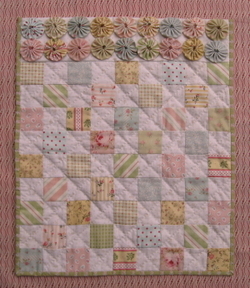 It's still not too late to enter the draw for a chance to win a copy of the pattern Molly's Doll Quilt. All you need do is post a comment. Now that has to be easier than resisting chocolate. 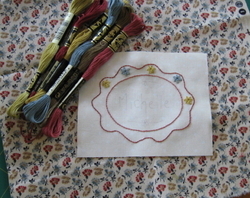 I realised I'd missed loading this pattern, Flowers of Thread, into the patterns album. When I made this I just couldn't stop at the drawstring bag, but had to make a second bag with the centre panel, etc pieced. 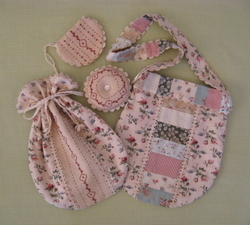 I do love the drawstring bag, pincushion and needlecase as a matching set, but for me the pieced bag is rather special. Something to do with scraps, perhaps? It happens every year. I make a list of all the ideas I have for projects early in January and full of excitement I begin work. Then I wake up one morning and it's March. Can someone please explain to me what happens to January and February? I even had an extra day this year! I did finish writing the pattern for Molly's Doll Quilt. You'll remember this from an earlier post. 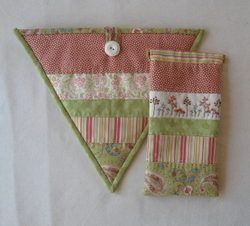 This little quilt was fun to make with fabrics from my stash of scraps. 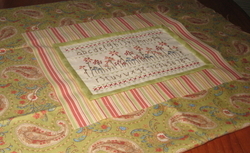 Although I'm calling it a doll's quilt, I think it would make a lovely gift for a baby. I know I would have loved a little quilt like this for my girls. 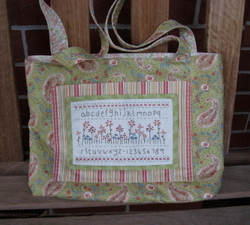 To celebrate my first pattern for 2008 I have one copy to giveaway. 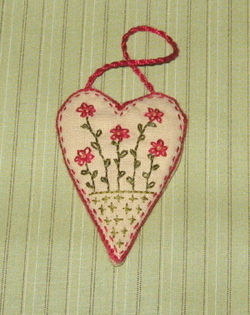 To enter the draw, for the chance to win a copy of this pattern, please post a comment by Saturday 8 March.